Highlights errors using red squiggly lines. Highlights warnings using yellow squiggly lines. Adds a light bulb with a warning sign or error sign to the vertical ruler. Placing the mouse pointer on a squiggly line. Clicking on the light bulb. Placing the cursor in the highlighted text and selecting Quick fix from the Edit menu or clicking shortcut Ctrl + 1 . In the above diagram, getId is highlighted because the Person class does not have a method called getId(). 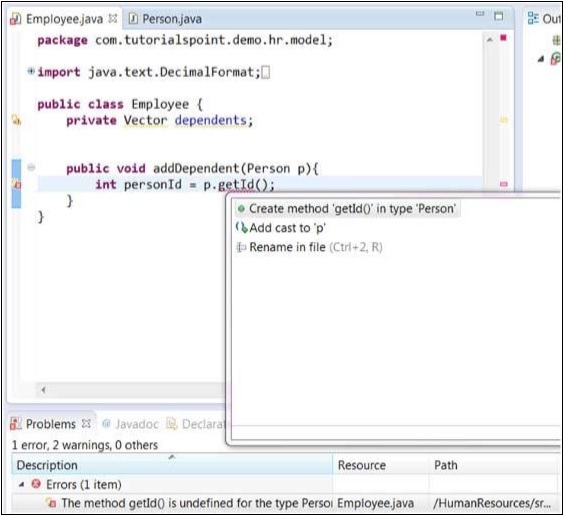 Selecting Create method 'getId()' in type 'Person' would cause the getId() method to be added to the Person class. The Quick Fix dialog can also be displayed by right clicking on the error item in the Problems view and selecting the Quick Fix menu item.